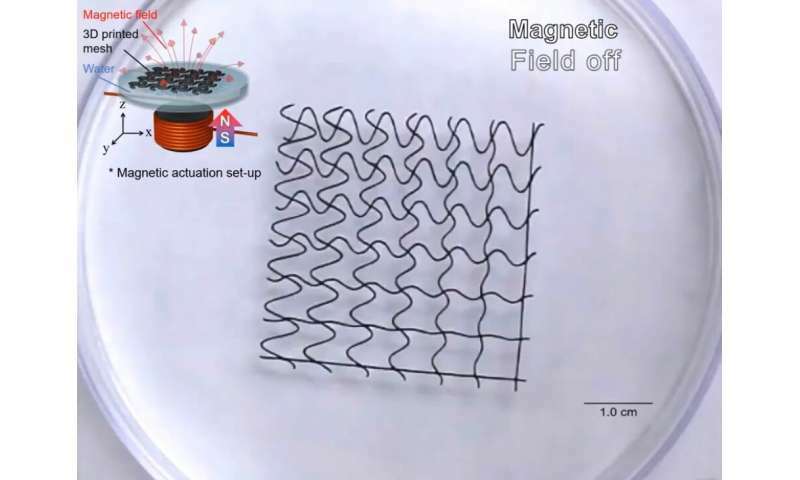 Researchers at North Carolina State University have created 3-D-printed flexible mesh structures that can be controlled with applied magnetic fields while floating on water. The structures can grab small objects and carry water droplets, giving them the potential to be useful as soft robots that mimic creatures living on water surfaces or that can serve as tissue scaffolds for cell cultures. "This research shows capabilities in the emerging field of combining 3-D printing and soft robotics," said Orlin Velev, S. Frank and Doris Culberson Distinguished Professor of Chemical and Biomolecular Engineering at NC State and corresponding author of a paper describing the research. To create these structures, the researchers made an "ink" from silicone microbeads, bound by liquid silicone and contained in water. The resulting "homocomposite thixotropic paste" resembles common toothpaste, which can easily be squeezed out of a tube but then maintains its shape on your toothbrush without dripping. The researchers used a 3-D printer to shape the paste into mesh-like patterns. The patterns are then cured in an oven to create flexible silicone structures that can be controlled—stretched and collapsed—by the application of magnetic fields. "This self-reinforced paste allows us to create structures that are ultra-soft and flexible," said Sangchul Roh, an NC State Ph.D. student in Velev's lab and first author of the paper. "Embedding of iron carbonyl particles, which are widely available and have a high magnetization, allows us to impart a strong response to magnetic field gradients," added Joseph Tracy, professor of materials science and engineering and a senior co-investigator on the project. "The structures are also auxetic, which means that they can expand and contract in all directions," Velev said. "With 3-D printing, we can control the shape before and after the application of the magnetic field." The structures' properties also allow them to be used while floating on water, similar to water striders, or insects that skim or hop across water surfaces. "Mimicking live tissues in the body is another possible application for these structures," Roh said. In the paper, published in a special issue of Advanced Materials Technologies, the researchers showed how they were able to design reconfigurable meshes, a structure that could "grab" a tiny ball of aluminum foil and a structure that can "carry" a single water droplet and then release it on demand through the mesh. "For now, this is an early stage proof-of-concept for a soft robotic actuator," Velev said. Unicellular organisms like Amoeba and then Octopus are nothing but Living Robots. We are still unable to copy their physical structures. First create their external body structures in the labs and only then think of making them move.